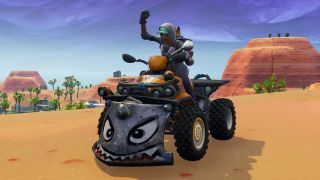 We've seen a number of vehicles come and go in Fortnite, but arguably the most useful mode of transport available is still the Fortnite Quadcrasher. This two-seater quad bike is pretty loud, so you won't be able to sneak up on opponents while driving it, but that doesn't really matter when the front-mounted plough allows you to smash through obstacles in your way. Combine that with the Quadcrasher's rocket boost and you can briefly destroy any structure you hit, so nothing will be able to stand in your way. You can also use this rocket boost to drive up otherwise impossibly steep slopes, or launch yourself into the air where you can show off by performing tricks. We've checked all over the island, to bring you details of where many Fortnite Quadcrashers can be found. The Quadcrashers are usually found near campsites, in garages, or on the back of trailers. Once you've found one, hop on the back and fire up the rocket boost, then get ready to cause some serious vehicular destruction. Looking for more Fortnite vehicles? Our Fortnite Ballers guide will show you all the locations you can find a giant hamster ball.